This one’s for all the tuna noodle casserole fans out there—especially if you’re a lone TNC lover in a sea of haters. (If you shudder at the thought of tuna noodle casserole, it’s best just to move along today, since there’s nothing I can say or do to change your mind.) But if you are the only person in your household who gets a hankering for the oddly comforting combo of tuna, creamy sauce, and carbs, I have something that just might make your day. See, I’m the solo eater of tuna noodle casserole in this household. Dan won’t touch the stuff with a 10-foot pole, and frankly, I can’t fault him for being weirded out by one of my favorite comfort foods in this case. 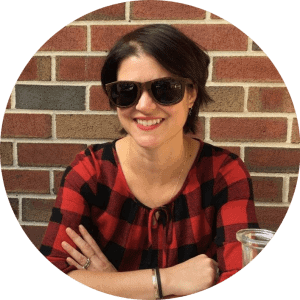 TNC is a decidedly divisive dish—something even those of us who love it passionately must acknowledge. And as with many foods that I love but Dan hates (see also: kielbasa and sauerkraut), I’m forced to either make a full serving and figure out how to offload the leftovers once my feedlots has been satisfied, find a restaurant that makes the dish to my home-cooked specifications, or forego the craving altogether. The issue of downsizing typical family-style, large-portion dishes like casseroles is a common complaint in smaller families like ours, though I’m sure Harry the Whalecat would be happy to try a taste of many of the foods I attempt to make in smaller portion sizes. Sadly for the cats, I’ve come up with a solution that lets TNC lovers eat as much—or as little—as they want, whenever they want! By baking tuna noodle casserole filling into pasta shells—the same ones you’d typically fill with ricotta for a traditional Italian-American dinner of stuffed shells—classic TNC is transformed into a portable, freezable package. Bake them in single serving sizes if you have tiny casserole dishes, or make a big batch and portion them out as needed or wanted. 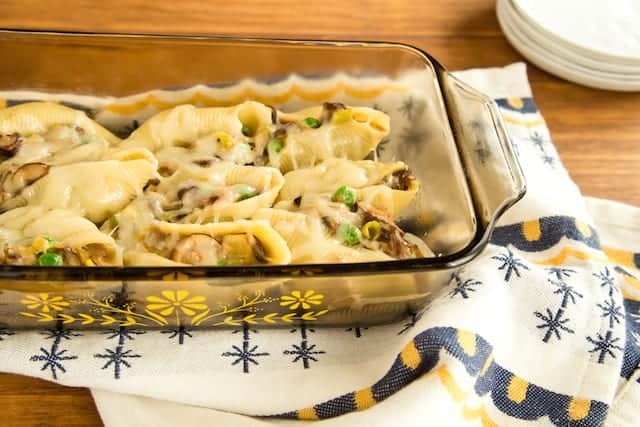 I’m always lukewarm about reheating blocks of frozen noodle casseroles and finding they’re not as creamy and full-bodied the second time around, but that’s not a problem here: that killer filling stays on point when tastily tucked away in its shell, even after thawing and reheating. Oh, and TNC haters? If you’ve managed to make it this far without heaving, I do have a little something for you, after all: a cheeseburger pasta casserole version of the recipe that I created for Today.com. Now everyone has something to eat for dinner, right? Put on a pot of salted water to boil for the pasta shells, if you haven’t cooked them already. Preheat the oven to 375˚F. Melt 1 tablespoon butter in a large, high-sided saucepan over medium-high heat and stir in the mushrooms. Cook without stirring for 3-4 minutes to brown the mushrooms, then stir in a pinch of kosher salt and cook for 2-3 minutes more until the mushrooms are deeply browned. Scrape the mushrooms into a bowl and set aside. Reduce the heat to medium, add 1 tablespoon butter to the pan, and stir in the leeks with another pinch of kosher salt. Cover and cook for 3-4 minutes, until the leeks have softened slightly. Uncover and cook, stirring occasionally, for a few more minutes until the leeks are very tender. Scrape the leeks into the bowl with the mushrooms. Melt 2 more tablespoons butter in the pan, then whisk in the flour. Cook, whisking constantly, for 2-3 minutes, until the flour is golden brown and starts to smell nutty. Whisk the broth into the flour in a steady stream; the flour will clump up at first, but keep whisking to smooth everything out into a sauce and to scrape up all the browned bits on the bottom of the pan. Whisk in the milk and pepper, and bring the sauce to a simmer. Cook for a few minutes, until it thickens, then remove from the heat and stir in about 1/3-1/2 cup of the Gruyere until melted. Taste for seasoning and add more salt if desired. Stir in the reserved mushrooms and leeks, drained tuna, and frozen peas. Butter a 9×13-inch glass or ceramic casserole dish with the final tablespoon of butter. (I wouldn’t use a metal pan here; things can get a little too crispy for my taste.) Fill the shells with the tuna casserole filling and place them in the pan. Top with the remaining Gruyere cheese and breadcrumbs, if using. Bake just until the cheese is melted and bubbly, about 15-20 minutes. 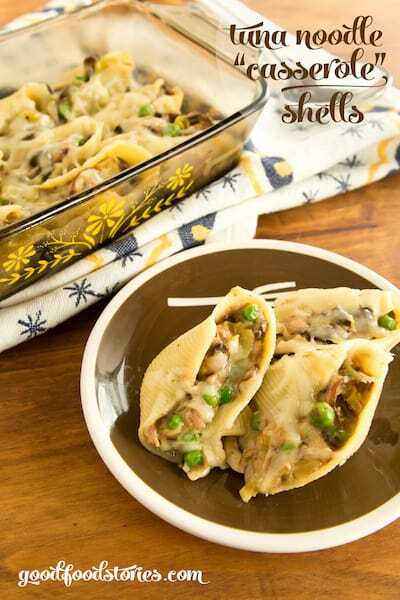 Serve immediately, or cool to room temperature and divide into single-serving portions (about 4-5 shells per serving). Freeze, wrapped well, for up to 3 months. Thaw in the refrigerator before reheating.